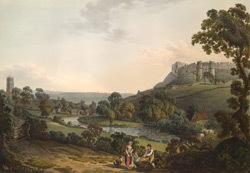 View of Carisbrook Castle in the Isle of Wight. The Doomsday Book states that the castle was built in the 11th century by William FitzOsbourne, this would have been a wooden castle and it was not until the 13th century that it was rebuilt from stone by the de Redvers family. In W. H. Davenport Adams’ book ‘The Isle of Wight; Its History, Topography and Antiquities’, published in 1862, Carisbrook Castle is describes thus, “… [it is] so grand even in its very decay, whose crown of towers circles the artificial mound rising with such abruptness out of the fertile valley, 239 feet above the sea… crossing the brooke which, with the cear (a stronghold or fort) above it, gives its name to the village”.